We recently discussed two "Road Diets" that would benefit safety and traffic flow of the area. Another major traffic and safety obstacle in the area is the diamond shaped intersection of W. Glebe Rd and Mt. Vernon Ave. It is problematic for both pedestrians and drivers. 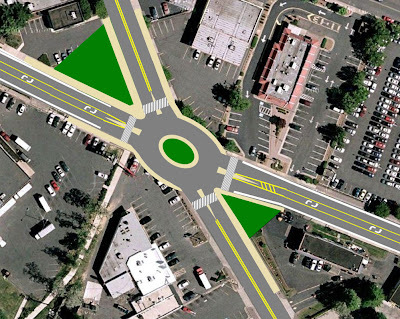 This is not a novel observation: the following image is a conceptual plan for intersection improvement from the 2003 Arlandria Plan (PDF), though it is not clear if this particular alignment is still on the table. I spoke with Sandra Marks at T&ES this week on the status of intersection evaluation. The city hosted a midday meeting in March that a few citizens were able to attend, but that was geared mainly towards business owners. The city of Alexandria is currently studying short and long-term solutions for improvements, though she could not go into specifics at this point. They're working with Kimley-Horn on the engineering study. She did say they were considering numerous alternatives for the intersection and that they would be discussed with the community in early September. One solution mentioned in our conversation was a roundabout, considered one of the long-term alternatives due to its impact on surrounding properties. Let's look into the Roundabout option. There were highly significant reductions of 38% for all crash severities combined and of 76% for all injury crashes. Reductions in the numbers of fatal and incapacitating injury crashes were estimated at about 90%. Here is a quick VDOT pamphlet about driving in roundabouts with a few pro-roundabout tidbits on the second page. I mocked-up an oval roundabout option below, though this is merely a drawing and does not take account of all roundabout design and engineering considerations. Until we see the options being developed, it will be difficult to choose a preference, but a roundabout seems the best option for safety, traffic flow, and aesthetics. A circular roundabout would be ideal, but that would cut significantly into surrounding property due to the geometry of the intersection. For the mock-up, I made the assumption that all approaches to the intersection will be 2 lanes based on the road diet article linked above. Since W Glebe carries about 19,000 Average Daily Traffic (ADT) and Mt. Vernon only 12,000 ADT, the oval should be oriented to minimize the turning radius for traffic on W. Glebe. 1. Tendency to promote jaywalking. 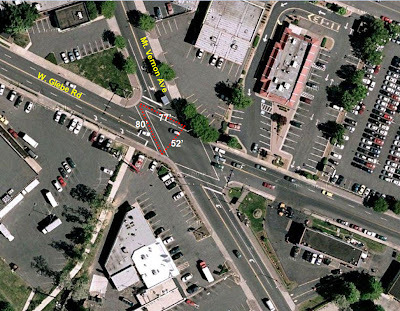 To get from the Southwest corner to the Northeast corner of the intersection is via crosswalk is roughly a 160 ft. The straight-line distance between these two points, jaywalking diagonally, is only about 52 ft (see image for clarification). To cross legally, you must walk nearly in the opposite direction of where you are headed. This makes jaywalking tempting as people tend to avoid walking in what feels like the wrong direction. The Jaywalking Fix. In the roundabout scenario mocked up below, that same southwest to northeast corner trip would be reduced about 43% to a 90 ft. walk. Jaywalking is disincentivised because the path around the roundabout seems more natural to a pedestrian. Besides the tendency to cause jaywalking, one pedestrian safety problem with the existing intersection are the two free-flow right turns from W. Glebe onto Mt. Vernon Ave. Cars often assume they have the right of way and come close to hitting pedestrians in the crosswalk. 2. Left turn from eastbound Glebe to Northbound Mt. Vernon. A major driver problem with the existing intersection is this left turn is not a dedicated left turn. Traffic backs up as left turners have to wait for long lines of oncoming traffic to clear the intersection. It's common for few cars headed straight or left to make it through the intersection during a light cycle when a left turner is near the front of the queue. Cars headed straight dart into the right turn lane to get around left turners which causes additional accident risk. Many pedestrian friendly designs would increase pedestrian safety somewhat but would do little for the traffic problems at the intersection, nor the aesthetics. The Fix. A "modern roundabout" where there are no stop signs or traffic signals and traffic approaching the intersection yields to traffic in the circle keeps traffic moving. There are no left turners as all drivers turn right into the roundabout and continue around the circle to their exit point. Traffic keeps moving and all drivers have equal priority. 3. The intersection is situated as a gateway to the neighborhood, but lacks any distinguishing features other than a difficult traffic pattern. The intersection is surrounded by parking lots and plastic back-lit signage. It puts an unwelcoming foot forward for northbound traffic. On top of that, it is an awkward intersection. The Fix. A roundabout always includes a raised portion in its center to slow traffic and deflect cars in the right direction. Within this curbed-off area, landscaping, a statue, or other public art indicative of Arlandria can be added to present a welcoming gateway. Traffic signals are removed and the intersection is left uncluttered. Why not now? The biggest obstacle to the roundabout option, besides cost, is the encroachment into the parking lots of LoanMax and the 7-11 shopping center. With the sample configuration I mocked-up, LoanMax would lose minimal spaces (perhaps none) and the shopping center with 7-11 would likely only lose up to 7 spaces. However, the 7-11 lot could re-align several spaces and get some or all of those 7 spaces back. So, if the city would attempt to work with these businesses to avoid having to utilize eminent domain, a roundabout could be built without upsetting businesses too much, if at all. After all, selling a small slice of property that is being used for parking spaces that could probably be replaced seems like a good deal to me. Capital Improvement Funds are allocated to the area, so money is available for the intersection if that ends up a neighborhood priority. Maybe the roundabout doesn't need to be such a long-term alternative, after all. To inquire about the intersection work and let the city know you'd prefer a roundabout, contact Sandra Marks (email: sandra.marks@alexandriava.gov , phone: (703) 838-4411 x170 ) or send an e-mail to the mayor and city council stating your preference and that you'd like to see Arlandria Capital Improvement Program funds go towards this project. You could also mention Arlandria's need for a road diet, while you're at it. You'll have your opportunity to raise your comments following the early September meeting, as well. You will also want to switch to sattelite view. Nick - for a true roundabout with no traffic signals I believe your going to need a much bigger circle - ala Chevy Chase circle. A big circle means it takes cars longer to get around and gives cars entering the circle more of a chance to find a gap. Nikolas, Thanks. I agree that the Quaker/King/Braddock area is a traffic and pedestrian nightmare, as well. Your proposal looks like it makes a lot of sense. At least a lot more sense than anything there now. Drop me an e-mail if you'd like to write a guest blog about your proposal (nickdeuva@gmail.com). fourthandeye, you might be right. Like I said, I didn't approach this 100% from an engineering perspective, more as just a proposal to get things rolling. I wonder if slowing down traffic enough using various methods (thinner lanes, etc) might nullify some of that problem. A larger roundabout would impact surrounding businesses more significantly and would be a much harder sell. I'm certainly not a traffic engineer. But I don't think oval will allow for a true roundabout with no traffic signals. When I picture it, because of the X shaped intersection, the southbound Mt Vernon Ave is trying to enter the circle at nearly the same point the northbound traffic is trying to exit to W Glebe. That seems like trouble for a roundabout with no lights. A bigger rounder circle would allow the entry/exit points to have more spacing. 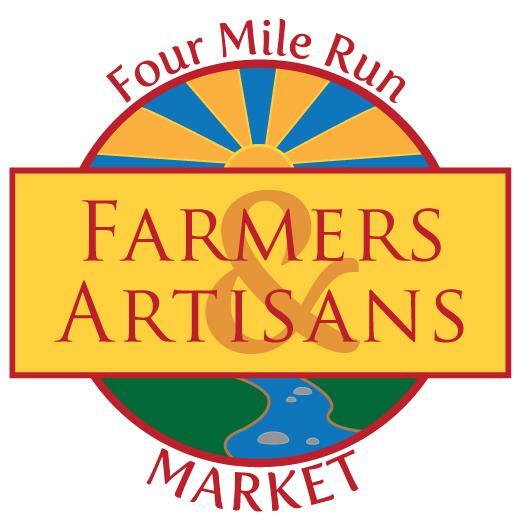 Of course, as you recognize, the landowners won't be supportive of forfeiting the space. At best with this scheme I think you have to keep the traffic lights. Then the oval just mainly serves to deter cars from blazing through at top speed when they have the green. Actually, an oval here could work because the sharp angles are not common turns for drivers to make if you look at it in the context of the larger road network. I think an oval could really work here. Most cars would go straight through the intersection or take the easy right turn. Sorry... easy right or left turn depending on the direction. so many things wrong here. The streets & sidewalks are isolated from the buildings by parking lots, which makes them useless. That's the first thing that has to be changed. Each building acts like a cult-de-sac - very bad - instead each building needs to connect to other buildings directly - put them all on a common street - lets call it a "main street". You need to create a compact destination for all the cars to park so they aren't wasting all the space. Space is money. Space is time. Don't waste it with auto parking. And don't under-charge for it. The sidewalk is always next to the buildings, and leads you to the front of the other buildings, so that you can actually walk places. Draw a line for the sidewak between each of the buildings' front doors. The same sidewalk needs to go to the residential areas, so people can get home again. The car/bike lanes go next to the sidewalk - maybe - because not every area needs to be accessible by car. If you are dependent on the car to get around, the design has failed. Get rid of all these sprawling parking lots - which takes up 60% of the land around the intersection in question. That land is too valuable to be wasted like this - that's all wasted economic and social activity. Instead put in one tall parking garage, use the rest of the space for housing and other commerical space, and more green space. And by the way, a roundabout would need to be WAY bigger than that. That is a perfectly fine size for a roundabout. I believe there are master plans for that area that would encourage much denser development of the area so hopefully the parking lots would go away. I also don't think he drew out every sidewalk. Again, didn't approach it from an informed engineering perspective, just looked at what I could and thought about primary travel directions and not setting too big of an offset. For Maryland's roundabout design document, click here (PDF page 37 discusses geometry). I never found one this good for VDOT, though here is their general roundabout info page. Where you don't see a sidewalk, I was trying to imply the existing sidewalk was fine (might be hard to see on the image). Nikolas is correct, there is a plan for denser development on the North side of the intersection. Some of us are pushing for pedestrian friendly businesses to the South of the intersection as well. Development projects are slowly headed north from Del Ray (Calvert and Mt. Vernon Commons).